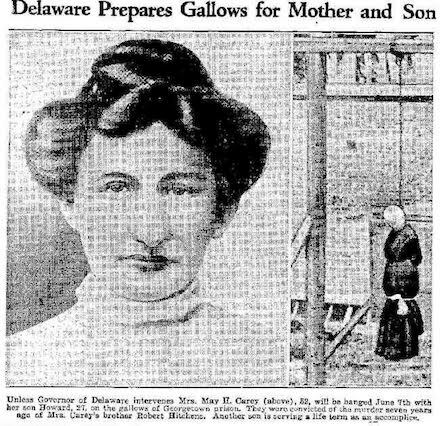 On this date in 1935 in Georgetown, Delaware, a mother and son were hanged for the murder of Robert Hitchens, May Carey’s brother and Howard’s uncle. The execution of May, 52, attracted some attention as it was the first time in living memory that a woman had faced capital punishment in Delaware. The last time a woman was executed there had been in the 1860s. On November 7, 1927, May enlisted the help of her two oldest sons, Howard, then 20, and James, 16, to murder their uncle Robert. May had taken out a $2,000 insurance policy on his life and promised to buy her boys a car if they helped her. After Robert got home from work, the three of them jumped him, beat him with a club and sledgehammer, and then finished him off with a gunshot to the head. They poured alcohol over his body and down his throat and rummaged through his belongings in an attempt to make the murder look like a robbery. The police fell for the robbery gambit and thought Robert had been slain by bootleggers. For a long time it appeared the trio had gotten away with it. But murder will out. The homicide went unsolved until December 1934, when May’s youngest son, Lawrence, was arrested on an unrelated charge of burglary. He told the police everything he knew about his uncle’s murder, which was enough to put his mother and brothers behind bars. May, James and Howard were all convicted but the jury recommended mercy for the two young men. In the end, James was sentenced to life in prison but Howard, who had sired a family of three children, got a death sentence, as did his mother. During the time period between the trial and the time the sentence was carried out, both Howard and May turned to religion for solace and read their Bibles “cover to cover.” Their last meal was cake and ice cream. Authorities erected the gallows behind a high fence to conceal it from prying eyes. They even stretched a piece of canvas overhead to prevent aerial photography. A single rope was used for both hangings, and May was first in line. She wore a new black dress with white ribbon around the throat. Her son was dressed in a formal suit and tie. Mary died at 5:30 a.m. and Howard followed her at 6:08. As for James, he outlived his mother and brother by only nine years, dying in prison of natural causes at the age of 34.